Thursday, January 1. Wow! I slept right through to 6:30 this morning. When I opened my iPad to check the latest news, it was all about snow in Phoenix and the nearby areas. My thermometer said 38 degrees on my patio but I saw frost in the golf course when I walked Frisco. 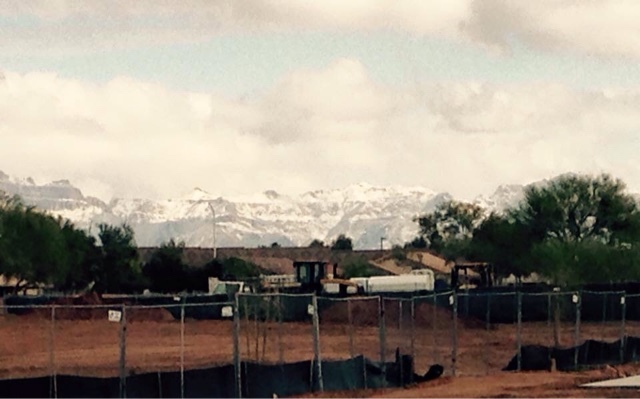 For the 2nd time since I've lived here, I saw snow on the Superstition Mountains as I went to work today. A friend posted this one on Facebook this morning. I got busy and took down the Christmas decorations this morning and only have the outdoor lights left to do. Work was another crazy time with no computer system. The weather prevented a lot of folks from arriving, so that might have been a good thing. The next week or so will be a challenge, but I have the next 2 days off so I'm not going to even think about it. Pat and Roger joined me for a roast chicken dinner tonight. Roger was sick, so we fixed him a hot toddy and he hung out in the recliner with a blanket over him. Saturday, January 3. I now have the crud that has been going around. Jan invited Connie and I to join them at her daughter, Jody's house where Paul was testing out the new smoker that he got for Christmas. I met lots of nice people and had some delicious ribs, pork, and chicken and other goodies. I just couldn't get warm, the entire evening and by the time I got back home, I was starting to feel the head and body aches are part of it. I spent the day at home, reading, knitting, napping, and doing laundry.